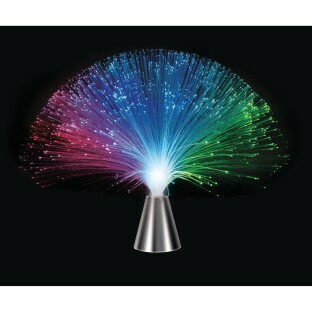 Brilliant color-changing light emits from the tip of each fiber optic strand on this 13" tall lamp for a dazzling visual display. Plus, this light can switch into a mode that makes the entire light actually vibrate and revolve in place for a fabulous multicolored light show! Requires 3 "AAA" batteries, not included. I thought that this would rotate but it vibrates loudly causing it to spin. I won't be using that feature. I am just using it on the regular mode.